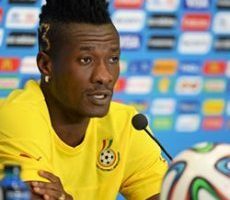 (Sporting Alert) — Ghana will seek to make only their second Africa Cup of Nations final in six tries when they take on Equatorial Guinea in the semi-finals at the Estadio de Malabo on Thursday. Ghana and Guinea will be hoping to book a semi-final place when the pair meet in the Africa Cup of Nations quarterfinal on Sunday. (Sporting Alert) — Ivory Coast gets its Africa Cup of Nations Group D campaign underway on Tuesday against Equatorial Guinea at Estadio de Malabo. CAPE TOWN (Sporting Alert) — The following are the quarter-final matches for the African Nations Championship 2014 on Saturday and Sunday, Jan. 25-26. CAPE TOWN (Sporting Alert) — Teams starting lineups for Thursday’s African Nations Championship Group B game between Zimbabwe and Uganda at Athlone Stadium. 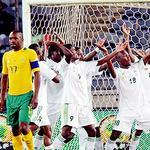 Starting lineups and live streaming and live scores from the African Nations Championship game between Group A leaders Nigeria and Mozambique at Cape Town Stadium on Wednesday. Starting Lineups for the African Nations Championship game between Group A leaders South Africa and Mali at Cape Town Stadium on Wednesday. The following are the starting lineups for the African Cup of Nations Championship Group C clash between Ghana and Congo at Free State Stadium. CAPE TOWN (Sporting Alert) — Starting line-ups for the African Cup of Nations Championship Group B game between Uganda and Burkina Faso at Athlone Stadium, in Cape Town. Cape Town (Sporting Alert) — The following are the starting line-ups for the African Cup of Nations Championship Group B clash between Zimbabwe and Morocco at Athlone Stadium in Cape Town.